This article is about the Christopher Cross song. For other uses, see Alright (disambiguation). (1983) "No Time for Talk"
"All Right" is a song written and recorded by American singer-songwriter Christopher Cross. It was released in January 1983 as the lead single from the album, Another Page. On the heels of his Grammy winning first album,  and following his #1 hits "Sailing" and "Arthur's Theme (The Best that You Can Do)" expectations were strong enough for this first single from his second album to allow "All Right" to debut on Billboard Magazine's hot 100 at the high-position of #29. It was the fifth-highest debuting single of the 1980s ranking behind Michael Jackson's "Thriller" (No. 20), USA for Africa's "We Are the World" (No. 21), Paul McCartney and Michael Jackson's "Say Say Say" (No. 26), and Men at Work's "Overkill" (No. 28). Unfortunately, "All Right" -- which featured former Doobie Brothers member Michael McDonald on background vocals -- did not repeat Cross's previous success, and petered out at #12, just outside the top 10. The song gained a measure of fame when it was used by CBS Sports for its highlight montage of the 1983 NCAA Division I Men's Basketball Tournament at the end of its broadcast of the championship game. The game, which saw North Carolina State, led by coach Jim Valvano, upset heavily favored Houston 54-52 when Lorenzo Charles caught an airballed shot by teammate Dereck Whittenburg and slammed the ball through the hoop on the game's final play, is widely regarded as one of the most memorable games in NCAA tournament history. Four years later, CBS introduced One Shining Moment to accompany tournament highlights at the end of the championship game broadcast, a tradition which continues. "All Right" was featured in the NBA footage bloopers during the 1982–83 season. It was also featured in the opening video of The Apple Worldwide Developers Conference 2017. ^ "Grammy Award Nominees 1981 - Grammy Award Winners 1981". www.awardsandshows.com. Retrieved 2018-09-14. ^ "Top 100 Songs | Billboard Hot 100 Chart". Billboard. Retrieved 2018-09-14. ^ "Best Michael McDonald Background Vocal Performances". Retrieved 2018-09-14. ^ "Ultratop.be – Christopher Cross – All Right" (in Dutch). Ultratop 50. ^ "Offiziellecharts.de – Christopher Cross – All Right". GfK Entertainment Charts. ^ "Irish Singles Chart – Search for song". Irish Recorded Music Association. Archived from the original on July 21, 2011. Retrieved July 6, 2011. ^ "Hit Parade Italia - Indice per Interprete: C". Hit Parade Italia. Retrieved July 6, 2012. ^ "Nederlandse Top 40 – Christopher Cross" (in Dutch). Dutch Top 40. ^ "Charts.nz – Christopher Cross – All Right". Top 40 Singles. 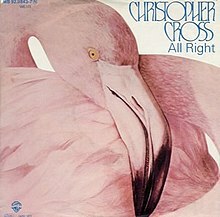 ^ "Norwegiancharts.com – Christopher Cross – All Right". VG-lista. ^ "Swisscharts.com – Christopher Cross – All Right". Swiss Singles Chart. This page was last edited on 25 March 2019, at 22:08 (UTC).